What happens in this one? Captive on a Federation prison ship called London, Blake and the other prisoners are on their way from Earth to prison planet Cygnus Alpha, a journey of eight months. Realising a voyage that long would make appalling television, Blake and his new-found acquaintances and fellow prisoners, lock-picker Vila and glamorous smuggler and pilot Jenna, meet the arch computer expert Avon and the heavyweight Gan. Spaceship The Liberator (although we don't know it by name yet) is found floating empty in space en route, but members of the London's crew who were sent to investigate all vanish. Blake, Jenna and Avon, having hatched a plan to disrupt and commandeer the London, are ordered to venture on board the mysterious ship, but instead take its helm, thinking they can use the ship to help fight the Federation. I can't explain why the past 49 minutes of 1978 prime time television is satisfactory viewing. On the face of it, it's visually as exciting as the under-carriage of a dead tortoise - a strange mix of browns, greens and multiple shades of grey, but once you get over that, it's a tale of daring-do and excitement in space, and Blake is at the centre. But the special effects are, at best, a bit awful. The highlight of all the 'special' action is the show's famous 'spaceship out of control and precariously camera wobbling' scenes - a mix of skill and dedication from actors and cameramen alike. I'm not an expert on television production techniques, but I'm sure that momentarily vibrating the camera and pulling over a stack of red 'space-age' tea cups so they fall towards camera - as an indication of space turbulence - wasn't something that the shot really deserved, but some of the model space ship shots are a bit more successful. There's also that special killer foam, that's meant to harden like concrete 'in seconds' and used by the crew to fix the holes in the prison ship's hull. It's just a shame it looks like shaving foam being limply squirted through a small hole in the wall by the work experience runner. And even more of a shame for poor young Nova, who at one stage looks like a potential permanent member of Blake's gang, as he meets his doom having to act with the stuff. So why is it worthwhile watching, while dodgy FX could render this whole episode incredibly painful? Well, to put it simply (because I can't ham this up much), it's the story. The writing is spot on most of the time, and the actors - including Leslie Schofield and Glyn Owen as London's crew, as well as the regulars - all seem to relish their parts, unless they're just really grateful for the work. And, as a taste of things to come, barely nine minutes into the episode, Avon has already spoken with what will become his customary contempt for Vila, although the exchanges are still to be developed. Right now, it's a not very witty: "You're a fool", but it's a start. And, where the first episode was painstakingly obvious when attempting exposition as it had a lot to set up, this episode flows much more neatly, and the interactions from what will become the lead characters are natural and suitably revealing. A key moment is the tussle with the guard, whose palm print is needed to escape from their locked room, with Gan's "Look, we only need the hand" comment: threatening, menacing - but witty. This isn't just a sci-fi show. It's a British sci-fi show. You didn't get that kind of wit on the Enterprise. This is clearly a sci-fi series that's not afraid to be clever, with attention to character as well as plot. It can handle the serious as well. When an unarmed prisoner is shot, it provides an opportunity for Blake to underline his morality: "Your first officer is guilty of murder, I demand that this incident is reported in your ship's log." This isn't just 'the dirty dozen in space' as the show has often been described. It's a new kind of 'bad guys with morals versus even badder guys without morals'. Later, when the empty spaceship is discovered I immediately thought it a rip off of Alien. Imagine how amazed I was when noting that actually Alien came out the following year (1979). Could there be a possibility that Alien director Ridley Scott saw this episode and took notes on how to make a successful worldwide blockbuster featuring a similar sequence? I somehow doubt it, otherwise the introduction of Orac later on in the series would have surely convinced him that Sigorney Weaver's character needed a similar side-kick in the film. 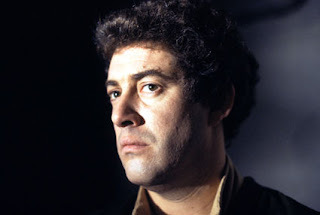 Blakes 7 is all rather slow by today's attention deficit-standards with each scene lasting for at least two minutes, but the intensity of the unfolding predicament keeps me interested. As Jenna, Avon and Blake get behind the controls of the expansive and flashy Liberator for the first time - the ship's name having come from her subconscious somehow, and picked up by the on board computer, Zen - Jenna in particular is enthralled. "It's beautiful. A ship like this can go anywhere," she coos, just before she fights off its mind-boggling defence mechanism which somehow turns your own memories against you, via some very soft-focus camera work and nightmare-style flashbacks. "We're on our way. We can go anywhere we like," says Jenna again, once they've recovered. At this point it seems churlish to respond with, "as long as it's a quarry in Dorset." But, with another of those dodgy animated Liberator-in-space flight shots, the adventure is only just beginning, and it feels like there are exciting times ahead. I will continue this retro reviewing experience. If you're watching it too, feel free to leave a comment below. 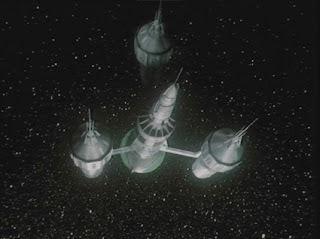 -Blakes 7 DVD rewatch: Season 1 episode 1: The Way Back. Sci-fi for grown ups?